Also known as endive or even witloof, chicory is a salad leaf that actually tastes of something! Whilst it's very popular indeed on the continent, the joy that is chicory hasn't really broken into the mainstream of the UK diet. That's pretty sad for something so tasty. A bulb-like leaf head (available in a red or a white variety) is also really versatile. You can peel the leaves off individually and use chicory in a salad or as little boats for canapés if you’re entertaining. It has a good, slightly bitter flavour that complements most salad dressings and contents. We particularly like it with creamy Caesar dressing and oriental flavours, but it’s pretty good in any salad really. The really interesting thing about chicory that sets it head and shoulders above other salad leaves is you can cook it too, for a whole new world of vegetable fun. Chicory soup is simply heavenly, or it works as a vegetable accompaniment to a meat dish or as an ingredient in gratin or stir fry. You can even puree it and whack it in a soufflé, it’s that versatile. Best kept in the fridge and in the dark. If you leave chicory in the light, the leaves turn green and the flavour turns too bitter. 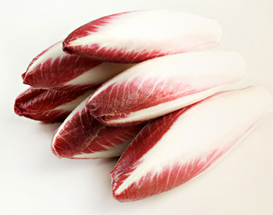 We grow, pack and supply red and white chicory to multiple retailers and wholesalers.